This blogpost is an update on our thinking and conversations about how this city could contribute to global food resilience and sustainability through our Community Choices Action Research programme. Although the challenge of feeding the world’s growing population seems far removed from our here-and-now local concerns, it isn’t. The recent hike in food prices tells us that; it looks set to continue, and is illustrative of stresses in the network from climate change, resource depletion and population pressures. The UK currently imports some 40% of its food and, if poor harvests as the 2012 floods caused or, indeed, if a hard Brexit happens, this proportion rises — and at a time when the global larder is coming under increasing threats from both climate change and from a rising global population (another billion of us by 2030). A year or so ago, we asked ourselves what role, if any, a city like ours could play in making a positive difference to food resilience and sustainability for others as well as ourselves, as outlined in this blogpost Birmingham as a ‘laboratory’: Changing diets, changing landscapes. Can changes in demand make a difference? We can’t increase food supplies within the city; 99.99% of all we eat and drink comes from outside the city boundaries. But could we make a difference from the demand-side? In this blogpost in October 2016, I quoted Tim Benton: We recognise that demand for food is driving emissions and work to change that to meet the supply-side improvements halfway.” Could we here in this city change our our diets, change our food demand and be a measurable element of meeting the ‘supply-side improvements halfway”? Would people be motivated to change their diet in order to change the agricultural landscape? Conversations with various communities around the city told us how motivated people are to see how their actions can lead to Birmingham contributing to global food resilience and sustainability. Health issues were, to many we spoke to, a far less significant driver for them to change in their behaviours — though health issues are, inevitably, of huge and growing concern to local and national governments across the world owing to the potentially crippling costs to society of poor diet (see below). What should we change, and how could we measure change and its impact? This city, as others, has a global footprint. As elsewhere, too, citizens consume food and drink with zero or low nutritional vale. Few, however, recognise that consumption of these products impacts global food security and sustainability. Would changing diets have economic impact? As a result of all this, what had actually began as an agri-Mapping Project right at the start of 2016, rapidly became more ambitious in scope. We’d learned through more than a year’s worth of conversations with scientists as well as communities, and through our own analytical work that a city such as Birmingham could play in driving food and drink demand in order to change agri-food supply side dynamics. Building on partnership we’d forged through this time with the NFU, Impact Hub Birmingham and the Warwick Crop Centre, we brought in others to help us design the programme: Nick Booth at Podnosh, the arts Narrativum team, Castle Vale community groups and TDL Creative . . . plus scientists at Rothamsted Research as well as those on our Panel of Experts, notably Tim Benton, Chris Elliott, Molly Jahn, Pam Sydelko as well as Warwick’s Rosemary Collier. Data drives behaviours . . . The Birmingham Model (see the brilliant ‘bike’ info-graphic below by the talented Oliver Tomlinson of TDL Creative) outlines how the Community Choices design and piloting of thinking tools, apps and context could trigger choices (C) which, aggregated to different population levels will change demand (B), which then in turn will have measurable impact back through the food network to primary producer requirements for soil, water and energy (A). The proposal is that we will experiment using VAT as an easily obtainable POS metric for household food and drink spend, and products listed on the Government’s VAT list to monitor catering services demand. As the bike infographic indicates, we’ve negotiated with three communities for their involvement. One is Castle Vale, a close-knit neighbourhood community of ~10K people; it performs poorly on socio-economic and epidemiological health indicators, and is one of several ‘food deserts’ in the city. And two choirs from this estate took part in The Hand That Feeds: A musical about food crime last year and more recently, this June. The second is Impact Hub Birmingham, which represents a demographic not geographic community. We talked to the Impact Hub founders at the outset of the Mapping Project and, among many other talents, their Andy Reeve has expertise in data and spatial analysis, critical for the co-design of tools and apps to trigger/enable behaviour change. 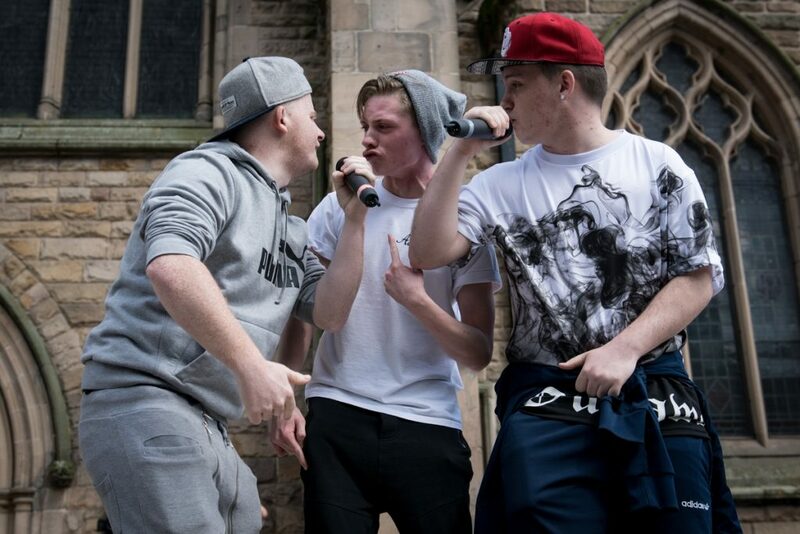 They represent a different, mostly young (adult) demographic, one that reflects the city’s ethnic diversity. And, as they’re keen to be actors as well as suppliers to the project, samples of their members’ demand data will be used too. 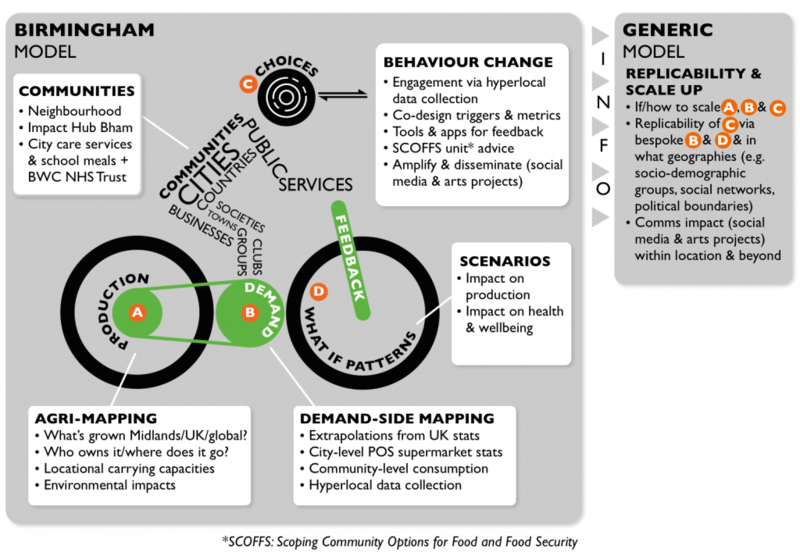 We’ve set up a small group of experts in what we’re calling the SCOFFS unit to advise us on tools, apps and context. Finally, a key component of this action research project is amplification (making messages more powerful in their effect) and dissemination (getting messages out to other communities in Birmingham and beyond) through Narrativium-style, community-led arts programmes. note: There is an update to this blogpost made in April 2018 here.